I have made these Perfect Chocolate Chip Cookies at least 20 times now. Not exaggerating. I first made these when we were in the Philippines, when it was a struggle to just keep butter solid for 2 seconds on the counter, and they were absolutely incredible. I had no idea how or why, but they just WORKED. And they blew my mind in the way only a perfect chocolate chip cookie really can. But then every once in a while, they didn’t work. I’m not always super exact with my baking, but still. They were not thick and chewy and buttery like the perfect cookie should be. Some of your comments said the same things – most of the time they worked, but sometimes they didn’t. And I don’t like that. Now I’m back home in dry, cool Minnesota and I have been waiting for this day just so I could figure out what would really make these cookies awesome for you. You who live in normal climates and shop at Cub Foods. I am now speaking your cookie-baking language. Since I’m responsible for bringing some treats up the cabin for my big family and I had an excuse to make excessive amounts of cookies, I made these. Many times. To get to the bottom of this cookie perfection. So here are my semi-scientific but mostly trial-and-error regular home cook tips for perfect chocolate chip cookies that look like this on the inside. Butter. Butter butter butter, butter. Butter. Yum. Whether I’m baking or sauteing or eating the butter straight off the stick, I always choose good quality salted sweet cream butter. And I guess by good quality I mean the grocery store budget brand. Because, well, yum. It tastes really good, so that’s what I use. Melt the butter about half way in the oven. For me, for this blog, for these ultra-thick cookies, we melt the butter HALF WAY or less. So literally I heat the stick of butter until roughly half of it is melted. This gives me the most success with a cookie that is both soft and structured. And guess where I melt my butter? Well, I told you already. In the preheating oven. It goes slowly and it keeps most of the stick firm while just gently melting off the outer layer, unlike melting in the microwave where the whole thing gets kinda soggy. Try to melt half or less – my goal is usually about one third and it usually takes just 3-5 minutes. Set a timer, please! Any more than that will start to make the cookies flat (and you can check out my last picture of my failed cookies for proof). Bring the butter back to room temperature. It’s almost like a soft solid again. I sometimes stick it in the fridge or freezer to help speed up the process but then I let it sit on the counter for a few minutes to come back to room temperature before actually making the dough. I KNOW, I KNOW, I KNOW this is annoying. Because you just want to make cookies right now. Believe me, I know. But hot melted butter just doesn’t work the same way as the cooled, soft-solid room temperature butter. Beeee paaatient. Just barely beat the egg. Just a little beating in with the sugar and butter will be enough. Too much beating makes the cookie more stiff, and I like ’em soft. Add flour until the dough pulls away. When in doubt, add a little flour to the dough, especially if the butter was melted. I always go by feel more than by measurement, because sometimes the amount of flour in a recipe (my OWN recipe) doesn’t seem right for a particular batch. This is what I always look for –> the dough to pull away from the sides of the bowl. Just slightly. When you’re using those electric mixers and mixing all your flour in with your dough, if the dough is just stuck all over the sides of the bowl and feels wet, add a spoonful of flour. And again, and again, until your dough is soft and dry to the touch and pulls into a large dough ball at the center of the bowl when you’re mixing it. I also notice that when I get just the right amount of flour in the dough, it makes kind of a delicate sticky noise when I stir it. Annnd you can file that under the world’s most obscure baking tips. 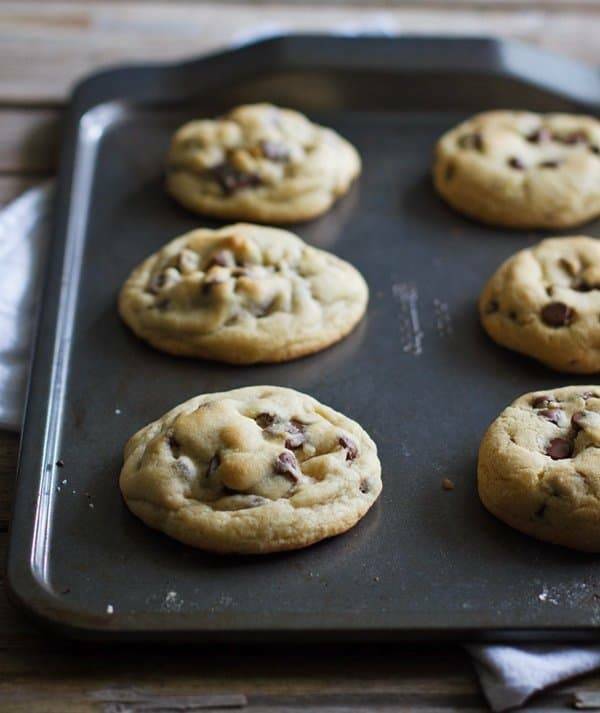 Use two kinds of chocolate chips. At least two, possibly ten. I love texture, so having at least two types or two shapes of chocolate in my cookie is a must. My favorites are Nestle semisweet chocolate chunks, Hershey’s milk chocolate chips, and Guittard dark chocolate chips. The slightly different tastes of the chocolate and the varied shapes and sizes of the chips make for a more interesting (ehmm, more chocolatey) cookie. This is a weird one, but I always have better luck getting that awesomely thick and buttery cookie when I make half of my favorite recipe. Go figure. I included the measurements for the “half” recipe at the end of this post. This is a SOMETIMES tip. For the recipe in this post, I found that I actually really didn’t need to refrigerate the dough as long as I had enough flour, but sometimes you bake the first batch and you get spread-flat-cookie-city. In that case, try refrigerating or freezing the dough until it’s more firm to help it stay together better. Use a Calphalon cookie sheet. I don’t have a baking stone or any other fancy baking sheets, just a few cheap Target finds that sometimes do the pop-bend while baking. So this isn’t a hard and fast rule – this is just the cookie sheet out of my very basic cookie sheet collection that seems to work best the most often. It’s non-stick, dark, and small. Hi, I’m a crazy cookie lady and I mean really big. Like possibly 1/4 cup of cookie dough big. If everything goes like it should, the more dough you can cram into that dough ball, the thicker and more irresistibly divine they will be. Shape your cookies by hand. I’ve spooned dough without shaping, I’ve used a special cookie dough scoop to get the rounded top, and yet the thing that works best for me is shaping them by hand. Like, literally, rolling them in between my palms to get a perfect round ball. Strategically place your chocolate chips. Sometimes I put tons and tons of chocolate chips in the dough, but then the tops of my cookies just look plain white. Mehhh. We want chunky, chocolatey cookies here. So I take a few chocolate chips from the dough bowl intentionally press a few extra into the top to make it look extra chocolate chippy. Look for barely browned spots. For this recipe, I always look for those very slightly browned spots on top. That’s how I know they’re done. Science shmience. For a regular baker like myself, sometimes baking just feels like a little bit of dumb luck. There are so many factors that can make a cookie great or not so great. Even if your cookies didn’t turn out juuust how you wanted them, I bet your dough still tastes pretty darn good, right? Grab a spoon and a glass of milk and enjoy. One more thing before the recipe! I wanted to show you my three failed batches during testing, and the things that I think made them turn out the way that they did. And here’s my two of my good batches and what I think made them turn out they way they did. Here are my simple tips for perfect chocolate chip cookies with an easy recipe for my all-time favorite, classic, perfect chocolate chip cookie. Turn the oven on to 350 degrees. Put the butter in the oven in a stainless steel or glass bowl as it’s preheating until about one third to one half of the butter is melted. Do not melt more than half of the butter. Turn the oven off. Let the butter come back to room temperature for at least 30 minutes – it doesn’t have to harden completely but it should be a soft solid. Add the sugar and vanilla. Cream with electric mixers until well mixed and lightly fluffy. Add the eggs and beat until incorporated..
Measure in the flour, baking soda, and salt. You can do this in a separate bowl, but I usually just dump it all into the mixing bowl. Slowly mix with the electric mixer on low speed, scraping the sides, until all the flour is incorporated. If the dough sticks to the sides of the bowl and looks wet, add one tablespoon of extra flour at a time until the dough feels dry and sticks together in one large ball. Too much flour will make the cookie stiff, so stop adding flour right when the dough starts to take on that dry look and feel. Stir in the chocolate chips with a wooden spoon. Preheat the oven to 350 degrees. Roll 1/4 cup dough into high, round balls with chocolate chips at the top. Place on a baking sheet a few inches apart and bake for about 9 minutes. You want to take them out when they are puffy and just a tiny bit brown on the tops and edges. Let stand for a few minutes – they will lose a little of their puffiness but they should stay thick and hold together well. Nope – not done yet! Because when I asked, these smarties (and more!) shared their tips with my on Instagram, Twitter, and Facebook! You guys! I am so excited to hear about your great aunt’s secret tip for using cornstarch, or how your grandma uses pudding mix, or how you buy a certain brand of butter and only use your own milled flour, or whatever else you do to make your cookies awesome. If you have anything to add, I would looove you. Yes and thank you!! I love all these tips and will be trying them soon! I just made chocolate chip cookies yesterday and while they turned out flat, they are still delicious but I will be trying your recipe next. These are such great tips! 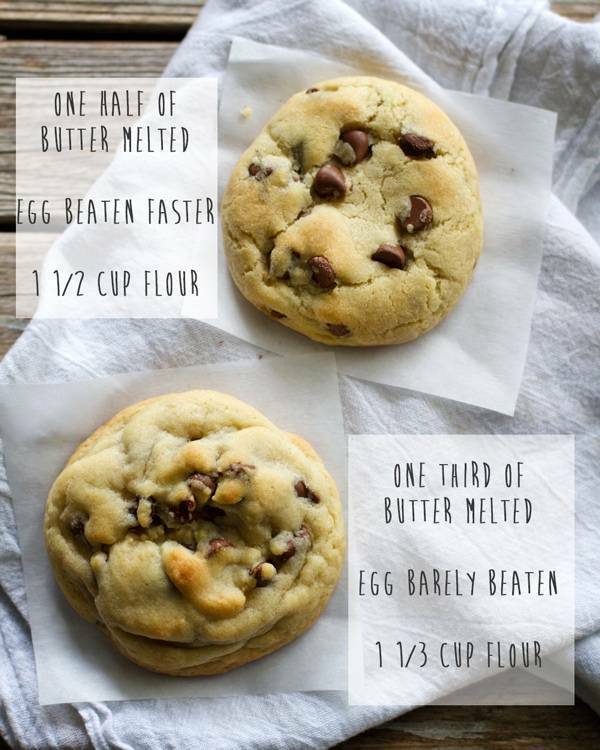 I actually need to bake cookies and brownies for an upcoming event so this information is very useful, especially the salted butter and rolling the cookies before placing on cookie sheet. Thanks! I am seriously saving this. What amazing tips!!! Love this post! I could really go for a batch of legit chocolate chip cookies, not the ones that usually come out of my oven (flat, crunchy, blech). Gonna give these tips a whirl ASAP! No way! you, the baker? We’ll have to do some baking together when we get back in town. You show me bread, I’ll show you cookies. I would get so frustrated when I made a flat batch, so what I did not to have that happen to me anymore, I started mixing into the flour, a small pack of Fleishmans yeast, no more flat cookies. These are awesome tips! Can’t wait to try some of them on my favorite choc chip cookie recipes!! Lindsay – this is such a welcome change to the straight-up recipes that claim to have the best formula to great chocolate chip cookies. 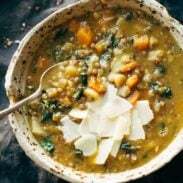 You are so spot-on that there is much more to getting them “just right” than what is in the recipe itself. So many factors! And as someone who is stuck in a hot, humid climate, baking recipes need a little adapting each time I make them. I even try to weight my ingredients, but sometimes I swear my flour is holding so much moisture from the air that it weighs twice as much as it should. Anyways – love this post, and will be putting all these tips into the rotation! There is almost nothing better, to me, than a great chocolate chip cookie! I love these tips, thank you!! Such great tips, I can’t wait to try em out! I also melt my butter in the oven as it’s pre-heating! I always felt like a weirdo doing this, so thank for making me not feel so alone haha. 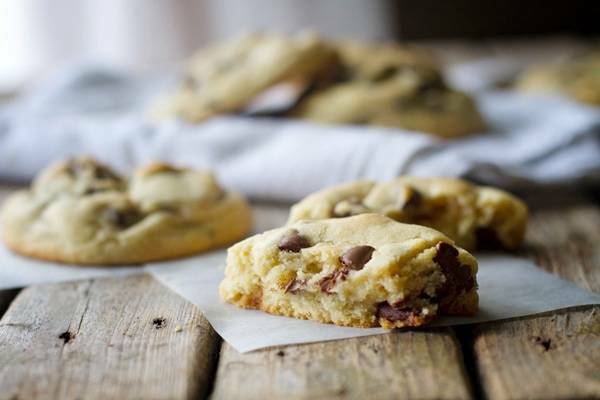 These are great tips, we love chocolate chip cookies around here, I’ll give yours a try. Yay! You’re the first person I know who does that, too! I wrote a chapter in my cookbook about what I thought the secrets to perfect cookies are. My cookie top 10 list and what to do/not do. And I will be honest, many things you do, don’t work for me. I HAVE TO, have to, have to chill the dough. Baking with warm dough equates to thinner, more spready cookies. So I always chill. I always, always bake on a Silpat. Not on just a regular cookie sheet. I always use a cookie scoop. Chilling, Silpat, and scoop are my must haves. I also don’t have as good of luck with melted butter in cookies as just softened butter. Love this list and your observations! Isn’t that the truth? It’s like different little things just work differently for everyone. Thanks for the tips Averie! Can’t wait to check out the chapter in your new book! I’m still on the quest for my own perfect chocolate chip cookie recipe, so I appreciate this post! I’ve tried chilling the dough and it doesn’t quite work for me as my cookies end up way too puffy for my liking. I’ve also tried different types of fats and am still on the quest for the perfect one. Interesting to see everyone’s suggestions and different ideas about chocolate chip cookies! I’m always striving to get the perfect cookie. Thank you for this. The more info the better in my book! I wrote a posting called cookie preaching. My cookies improved when all ingredients were at room temperature, I started weighing the ingredients, using unsalted butter, add one egg at a time, mix flour just to incorporate, chill the dough, use a cookie scoop for consistent size so you don’t have some undone and some overdone, or burnt, use a light colored pan, use parchment paper, pre-heat oven, use quality ingredients. When I use dark color pans I always sacrificed the first pan. Oh, and bake at 350°. I am not saying I am better at baking, only that this is what works for me. This is so awesome. Thanks for sharing these great tips! I think I might just have to go make some cookies now.. Thank You for these tips! The only one I have used is the refrigerating the dough one…oh…and using salted butter! I cannot wait to try the others – your cookies look AMAHZING! I’ve made your chocolate chip cookies before and know they’re good! GREAT tips! LOVED this post! It brought me right back to my Food Science classes where this was literally all we did – experiment with different things to see what effected what, where, when and why! I was literally just sitting and my desk trying to concentrate on work and NOT think about cookies… and then I opened my email to see this recipe and all of your beautiful photos. Mission failed. Now I want cookies. lol. Thank you for the beautiful photos & tips! P.S. I am so glad you include milk chocolate chips in the recipe! For the LOVE of cookies!! The (long gone) college scientist in me loves that you tried so many different methods and the lover-of-cookies in me knows that I would eat nearly all of your attempts (not sure about the spoon shaped, over baked one but I bet that would be great crumbled over ice cream too!) . What a fun post. Hope your family enjoyed your efforts!